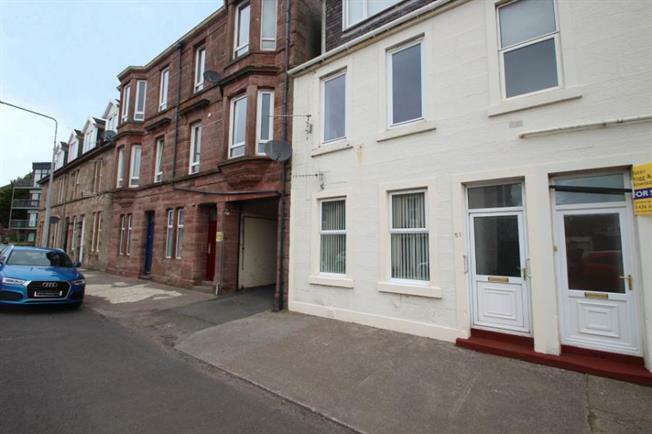 1 Bedroom Ground Floor For Sale in Helensburgh for Fixed Price £65,000. This charming main door, one bedroom apartment is located within comfortable walking distance from the wide range of amenities available within Helensburgh Town Centre. Accommodation comprises: Entrance vestibule; Reception hall; Spacious south facing lounge with feature fireplace housing a living flame effect gas fire; Breakfasting sized kitchen with integrated oven, gas hob and extractor hood, space and plumbing for washing machine and fridge freezer, door gives access to rear garden; Double sized bedroom with in-built bedroom furniture; Wet room with shower area (electric shower), WC and WHB. The subjects are enhanced by double glazing and a gas fired central heating system with 'combi' boiler. Immediately to the rear of the property, and accessed from the kitchen, is a good sized paved patio area which leads to the remainder of the well maintained gardens where drying and bin storage facilities can be found. The subjects are located outwith Helensburgh Town Centres parking zone.